A few quick thoughts and whims on what has been a busy final day of the rehearsal schedule. As recently this morning, we settled on the notion that we'd blown up yesterday's bad start by Brett Cecil into something way larger than it actually was. Shows what we know. Though we spouted off yesterday on Twitter about his impending demotion, a more moderate and rational quadrant of our brain assured us he would start the year in the rotation with the Jays. Those nefarious, prevaricating synapses told us: "Sure, he's messed up and throwing slop, but the Jays' brass will do their best with him in the early weeks, and be quick to pull him if necessary, but he'll stick." Stupid brain. Cecil's demotion speaks to the importance of a deep pitching staff. Through the winter, he was pegged to settle in as the number three pitcher behind Ricky Romero and Brandon Morrow, but it doesn't take a huge drop off for a mid-rotation starter to turn into a below-replacement arm. Thankfully, the Jays have a system full of emergency options that they'll be able to untilize should the need arise. A question that popped up on Twitter in the midst of this news -- and much credit is due to John Lott of the National Post and Shi Davidi of Sportsnet for getting the news out quickly -- is whether the Jays should have looked at an "innings-eater" like Gavin Floyd or Joe Blanton to pick up the slack. It wouldn't surprise us if Jays GM Alex Anthopoulos has something brewing in the background, in case something else falls off. But given their limited need for a fifth starter to begin the season, plugging the hole with Joel Carreno and giving a big league roster spot to Kyle Drabek seems like the smartest solution. And in passing: How many of us would have picked Drabek and Carreno over Cecil and McGowan just two weeks ago? A larger question going forward will be: What does this mean for Cecil down the line? Given that this is the third season in a row in which he's needed to reset himself and find confidence by pitching in the minors, the dreams of him being a front end start are probably beginning to fade. The argument for keeping him out of the bullpen -- anyone remember the "Cecil for closer" movement from three years ago? -- was that he had too many pitches and too much value as a starter. 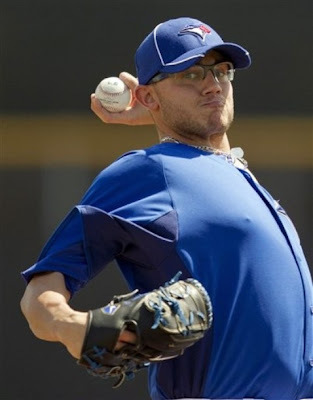 But with the number of starters who will push their way into the picture this year and next, it wouldn't hurt the Jays to consider limiting Cecil's repertoire and reworking his role into a bullpen lefty. Because Darren Oliver can't pitch forever. Welcome Back Joel: As for Carreno, we couldn't be happier with the Jays' decision to make him the early season starter. His minor league strikeout and walk rates (9.7 and 2.9 respectively) have intrigued us for a couple of years, and his 15 inning audition last season (14 Ks, four BBs, two earned runs in 15.1 innings) only further whetted our appetite. His fastball (90-92 MPH) has nice life to it, and he keeps the ball down in the zone, just where we like it. We were hopeful that he could make his way back to the Majors sooner rather than later, so his re-promotion was in some ways the bigger story for us. One Last Piece: It seems that the Jays will have to find something to do with Luis Valbuena by tonight, as he is out of options, but not likely to make the team barring an injury today. Valbuena didn't manage any better than a .544 OPS in the spring, and wouldn't seem to be enough of an asset to garner anything in return. Our best guess is that he either slips through waivers, or gets picked up by someone needing a biped with a pulse, and we never think of him again. One Last Promo: It's almost time for it to disappear from the shelves, so if you haven't read our piece on Kyle Drabek in the Sportsnet Magazine season preview, do us a solid and go pick yourself up a copy. There's 15 pages of Blue Jays preview mumbo-jumbo, including stories from Arden Zwelling, Shi Davidi, Mike Wilner, and some up-and-comer named Brunt. It's worthy of your perusal.